Narbin Magar is Experience Climbing Guide for any mountain in Nepal, Narbin Magar is from Solukhumbu District, He is the best climbing guide for Nepal wilderness trekking Pvt. Narbin Magar has climbed almost all Nepalese Peaks. The Mountains top of the wold Mt Everest summited two times and one time at Mt Pumari, Yala Peak, Chilu far east, Mera Peak, Island peak, and Pachermo peak. He had done advance ice climbing training, Khumbu ice training, and Advanced wilderness first aid training, also technical ruck training. 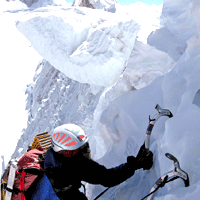 welcome to join for climbing with our experience guide as your Favourite peak climbing in Nepal.